Samantha Mather knew her family’s connection to the infamous Salem Witch Trials might pose obstacles to an active social life. But having survived one curse, Sam never thought she’d find herself at the center of a new one. This time, Sam is having recurring dreams about the Titanic. In her dreams, Sam walks the deck with first-class passengers, like her aunt and uncle. Meanwhile, in Sam’s waking life, strange missives from the Titanic have been finding their way to her, along with haunting visions of people who went down with the ship. So I have been looking forward to doing this review for over a month now because what better time to introduce you to a new YA PNR full of magic, mystery, ghosts, and suspense than on Friday the 13th? 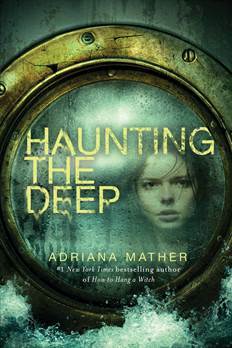 Haunting the Deep is a Standalone book from the author of How to Hang a Witch. While the story line is different in this book I think that in essentials you will have wanted to read How to Hang a Witch first to understand the bad story, especially the relationship between Sam, Jaxson, and Elijah, something that I will talk more about in a bit. In Haunting the Deep we return to Salem Massachusetts several months after the end of How to Hang a Witch. Life has become fairly mundane for Samantha Mather, something that she revels in. However, sadly for our dear Sam things won't stay that way and they are also never what they seem. I really enjoyed getting back into Samantha's world, I had to do a little digging in my head to remember all the little details that hop from the first book to this one, things that I won't talk about here because I don't want to give away any of the first story. What you need to know is that after a harrowing and horrific experience when Samantha first moved to Salem she's finally found a group of kids to call friends, gossip has started to slow down, and has begun to settle into her new life. As a reader though, we know that this can not stay the same and it isn't long before Samantha's world is once more turned upside down. The one person she thought she could count on always being there begins to act oddly and pull away, the group of girls (the Descendants) who she is reluctant to call friends but finds herself needing become more than she could have ever imagined. Keeping her secrets from her father become harder and harder and the boy she may have loved is gone....or is he? I love how Adriana weaves history into her stories, I love even more than this history is personal to her, it lends to the authenticity of her characters feelings and their motivations. I loved in this book, and am trying to thing of a way I can apply it to my daughter's schooling, how the entire school rallies around this one theme (the Titanic) and not only is it the theme for the 'Spring Fling' but in conjunction the history and literature teachers are having their students study the history of the Titanic. I love the underlying story of repression and how societies classes were viewed in the early 1900's. I found that you can see a lot of links between what we see happening on the Titanic and with our society today. This is not an overtly political book, don't think I am saying that at all, but I think if you are paying enough attention you can see something in here that you'll say still stands today and should be considered. Why is the 'villain' a villain in this book, it isn't as simple as being a 'bad person', there is an entire history here that brings about what happens in this book and I found it to be an interesting look both into the past as well as at our current world. Now, the one part that makes me go with a 4 instead of a 5 on the star rating for this book and I am certain this is strictly a me problem. The relationship and dynamics between Sam, Jaxson, and Elijah. I am struggling with this because I feel like though there was some magic involved we are watching the true feelings of one character get either shoved under a rug or completely trampled on, and it is painful to watch. We are watching a relationship between what is as of now two characters that can not sustain a relationship. The whole 'triangle', if it can truly even be called that, between these three is so anxiety and emo inducing that I struggled to get past it. My heart ached the entire read and not because of the history of the Titanic or the suspense of the storyline but because of this trio of characters and what or what they don't mean to each other. Also, I need a little more history of Mrs. Meriwether and Mr. Mather, haha. I think if you are a history nerd like me, this is a definite must read. Like I mentioned above the way that Adriana Mather weaves history into her fictional world is wonderful and insightful. You will absolutely walk away from this book to only having read an enjoyable story with endearing characters but also with having had a history lesson, same goes for How to Hang a Witch. There is a bit of light romance in this book but it is totally 'safe' for your younger YA readers, which is always a huge plus for me since I have an 11 year old advanced reader. All in all this is a great follow-up to the first book and I am really looking forward to more in the future. I am absolutely curious to see what treasures Adriana finds next to send her down another historical journey and into another great read for us! 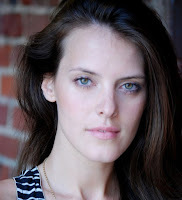 Adriana Mather, the New York Times bestselling author of HOW TO HANG A WITCH, is a full-time writer, producer, and actor. She owns a production company called Zombot Pictures, which has produced three films, including the award-winning Honeyglue. She lives in Los Angeles, California. Not only can Adriana trace her ancestry back to Cotton Mather and the Salem Witch Trials, she also has relatives who survived the sinking of the Titanic.